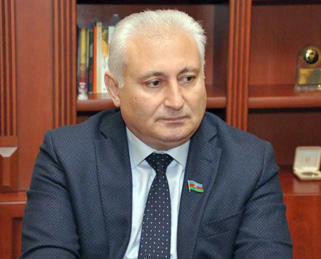 The Azerbaijani MP noted that this is why the South Caucasian countries, pursuing a policy that corresponds to the current realities both in the system of international relations and in terms of geostrategic interests, find it difficult to protect the common interests of the entire region. "In addition, Armenia continues its aggressive policy, moreover, it is trying to create ideological and military-political bases for the continuation of this policy. Thus, while still in power, former President Serzh Sargsyan said that Armenia has taken the first step towards the creation of a "great Armenia" – it has occupied Nagorno-Karabakh, and the remaining goals should be achieved by future generations," he said. "These goals mean the appropriation of the territories of the three neighboring countries. One of them is Azerbaijan, part of the territories of which has been under occupation for many years, the second is Georgia, where Armenia puts forward territorial claims to Javakheti region, and the third is Turkey, where Armenia also puts forward territorial claims to such provinces as Ardahan, Erzurum, Kars, Diyarbekir and Van. Armenia even puts forward territorial claims against Iran, in particular to the lake of Urmia," the Azerbaijani MP said. He said it is natural that in such circumstances, based on the realities and historical justice, the neighboring countries should fight together against this ideological provocation and aggressive policy of Armenia. "It is no coincidence that American analyst Joshua Kucher took a photo of a fictional "map" of "great Armenia" posted at the metro station "Republic Square" in the center of Yerevan and shared it on Twitter. On that photo, along with Azerbaijan, territorial claims are put forward against Turkey, Iran and Georgia. By displaying posters and photographs showing the direction of aggressive policies, the idea that the youth must continue this policy is inculcated into young people," said the MP. "Therefore, if we do not want the outbreak of a new war in the region in the future and if we want to protect the interests of the region, we must stop the propaganda of this aggressive policy," he said. The expert went on to add that a joint fight against this policy by four countries - Azerbaijan, Georgia, Iran and Turkey, against which Armenia puts forward territorial claims. "By carrying out offensive diplomacy, it is necessary to ensure that the means of ideological propaganda that create the basis for this aggression are strangled inside Armenia," Babaoglu said. The Azerbaijani MP believes that for this purpose it is necessary to conduct a broad information campaign. "The reason is that the aggressor country intends to pursue further aggressive policy against other states in the region. Therefore, in order to expose this aggressive policy of Armenia, the four countries can organize joint international conferences by inviting regional and international organizations. Otherwise, as long as Armenia continues this aggressive policy, it will be impossible to protect the common interests of the region," Babaoglu said.